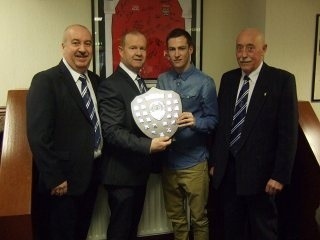 The Triangle Glenavon Supporters Club held their 63rd Annual Dinner and Award Presentation in the Bedeck Suite at Mourneview Park on Friday night. 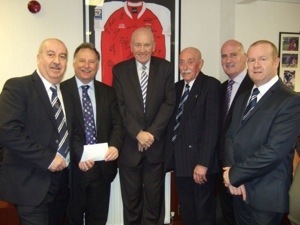 It was very well attended with former players Sammy Wilson, Paul Byrne and Robbie Beck in attendance. 1st photo. 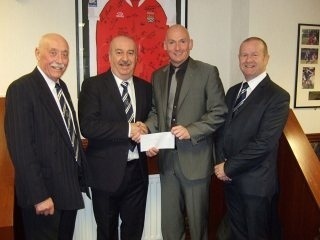 Triangle Treasurer Ralph Hewitt presenting a sponsorship cheque to Glenavon Treasurer Frazer Follis. Also, Adrian Teer (Glenavon Chairman), Jackie Murray (Triangle), Trevor Harper (GFC Vice Chairman) and Gordon Watson (Triangle Secretary). Final numbers for Annual Dinner on Friday night to be in by today Monday 22nd April.Anyone else looking to go can text Ralph their name. Starts 7.30 sharp. Last match of the season on Saturday. We are having a musical soirée after game with Walter Mitchell for a couple of hours so we are encouraging members to stay on a while. Sandwiches will be provided. **Notes for you diary. FA Cup final day 11th May. Day trip to Portrush 15th June. Glenavon play Portadown tomorrow Tuesday 16th April kick off 7.45pm in the final Mid Ulster derby of the season. The Triangle Supporters club will open at 6.45pm, hoping to see plenty of new and old faces in the Triangle club and at the game as we look to get a win over our rivals. This Saturday 13th April, Glenavon return to league action when they play Lisburn Distillery, kick off 3pm at Mourneview Park. 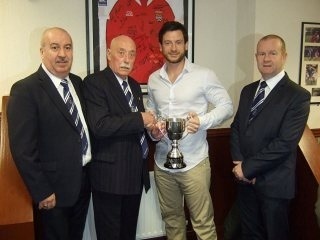 No league game tomorrow but Glenavon play Banbridge Town in the Mid Ulster Cup kick off 3pm. Triangle Clubroom open 1.45pm. We will also be doing a sweepstake for the Grand National and will show Ulster rugby quarter final game at 6.30pm. You are currently browsing the Glenavon Triangle Supporters' Club blog archives for April, 2013.